A consortium of European space scientists has succeeded in establishing a common data hub that allows the comparison of data from numerous space missions. A task that until now was hampered by different data processing protocols of individual space missions. Furthermore, observational data can now easily be compared with theoretical numerical models – regardless of the protocols used. The newly developed framework IMPEx allows scientists to better understand complex observational data, to fill gaps in observations with computer simulated data and to compare observations and simulations. First applications of the IMPEx tools allowed detailed comparisons of observational data from Venus Express (ESA) and Messenger (NASA) orbiting Mercury with existing simulation models. The comparison of observational data from the famous Rosetta mission with the respective simulation data will follow in the near future. Space missions are a bit like smart phones. A variety of different standards for data processing exists. Due to the complexity of space exploration, instruments and devices are usually purpose-made and data acquisition as well as number crunching tools are built using mission specific data structures and protocols. The downside: the exchange and comparison of observational data between missions and complex computational models developed by third parties are virtually impossible. There are already some initiatives which try to overcome this diversity of data formats by defining standards for specific physical branches. The EU consortium IMPEx makes a significant contribution to this effort, in particular by extending the data model SPASE (Space Physics Archive Search and Extract) to the area of computational modelling. In establishing the IMPEx portal, the user front-end of the IMPEx protocol, the group was able to provide a single point of access to an impressive set of functionalities that offer a comprehensive toolset to work with different observational and modelled data in the field of plasma physics. Commenting on this success, Dr. Maxim Khodachenko, project coordinator and senior scientist at the Space Research Institute (IWF) of the Austrian Academy of Sciences, says: "The IMPEx portal offers tools for the visualization and analysis of datasets from different space missions. Furthermore, several computational model databases are feeding into the environment." Indeed, the tools offered by the IMPEx portal are impressive. The portal itself provides access to a vast amount of observational data and simulation runs of the magnetic and plasma environments of several planets, moons and comets in the solar system which are also targets of several past, present and future European and international space missions. 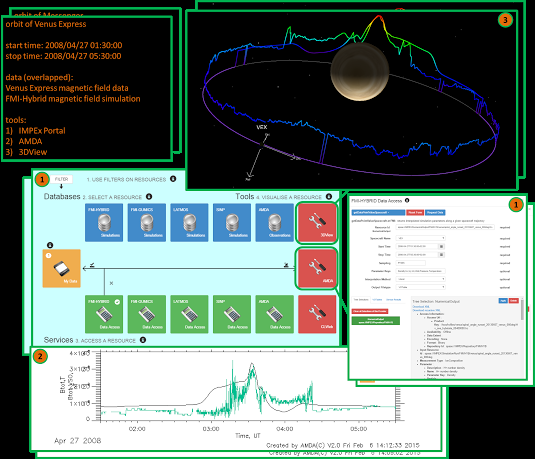 Web service methods supported within the modelling sector of IMPEx allow reproducing the magnetic field and space plasma environment of magnetized planets either on demand or even in real time. The starting point for data processing within the IMPEx portal is the so-called CDPP AMDA (Automated Multi-Dataset Analysis) tool. AMDA offers processing of data by providing simple access and easy-to-use data mining functionalities. It is dedicated to the analysis and visualization of observational and simulation data with a focus on space plasma physics. 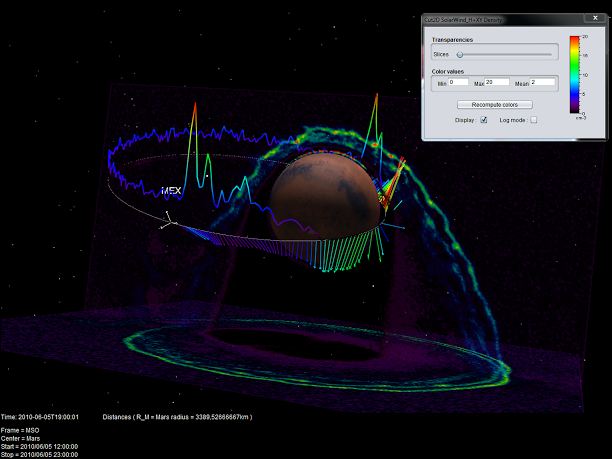 Another powerful IMPEx enabled tool is CDPP 3DView; with its massive 3D-visualization capabilities it offers the possibility of displaying spacecraft trajectories, planetary ephemerides as well as scientific representations of observational and simulation datasets. 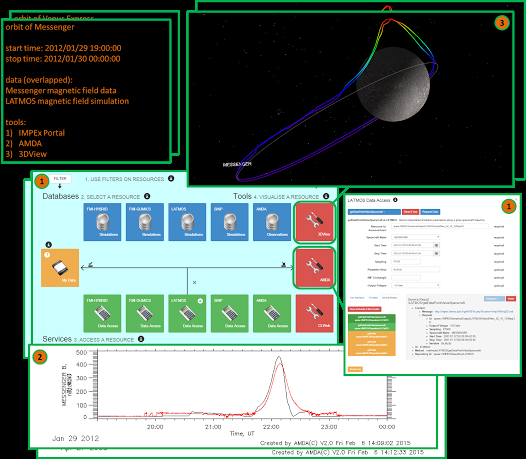 In fact, all IMPEx databases are directly feeding into 3DView, enabling an interactive combination of spacecraft orbits with their in-situ measurements and simulation data. Recently, 3DView already delivered impressive results when observational magnetic field data of the Venus Express mission were compared to a specific magnetospheric simulation model. Indeed, this comparison showed the entire power of the IMPEx protocol. The IMPEx partner FMI – Finnish Meteorological Institute – developed a Hybrid simulation database that allows for simulation runs of the Venus magnetic field environment. Selected simulation runs could be stored and further processed within the IMPEx portal environment. Also, the simulation run was interpolated onto the trajectory of the Venus Express orbiter and the in-situ measurements could be compared with the simulation. Finally, both datasets – the in-situ measurements and the simulation – could be visualized in 3DView, directly on the trajectory of Venus Express. A similar comparison was also done with observational magnetic field data of Mercury, obtained by the Messenger mission. Using IMPEx web services, simulations where interpolated onto the trajectory of the spacecraft and 3DView rendered the results. Vincent Génot, project scientist from CNRS /IRAP comments: "The possibility of combining complex simulation data with in-situ measurements in the same analysis tools is one of the biggest achievements of IMPEx. Soon the system will also allow the comparison of observational data of the famous Rosetta mission with the simulation of the cometary environment. This will greatly contribute to our understanding of the earliest building blocks of our solar system. Indeed, the powerful IMPEx system will facilitate and promote the research on plasma and magnetic field environments not only of "Chury", Venus and Mercury but also of other objects in the solar system, e.g. Mars, Jupiter, Saturn and Earth itself." The successful consortium, consisting, in addition to the IWF and FMI, of the French partners CNRS/IRAP and CNRS/LATMOS as well as of the Russian partner SINP-MSU, is not resting on its scientific laurels but already has plans for lifting IMPEx up into the cloud. Tarek Al-Ubaidi, project manager and technical expert, explains: "We would like to expand and complement the IMPEx concept with cloud resources and big data services. Especially the cloud execution of computational models would offer great advantages to the scientific community. We would like to combine this with a versatile architecture, comprehensive observational data archives and advanced data mining techniques. We have already submitted several proposals for realizing these ideas – let's keep our fingers crossed!"